Why just look at your calendar when you can draw on it? That's what Ruliweb community member "Zaku" does. 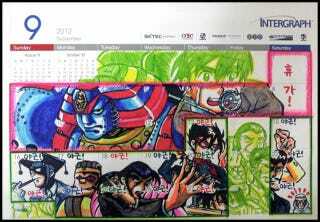 Zaku doodles on his calendars to mark when he has "work" (출근) and when he has "overtime" (야근). Days that aren't colored in are days off. From the looks of it, he works overtime on the week a bunch. Courtesy of Ruliweb and tipster Sang, below are his doodle calendars from the past few years. Oh, and good news: Zaku is currently working on a new calendar! Doesn't say what Zaku does, but the dude works a lot! Doodles a lot, too.